Catherine Engelbrecht, Leader of the King Street Patriots and True the Vote, wrote the following about an upcoming national summit in Houston to protect the virtue of our vote and integrity of our elections. 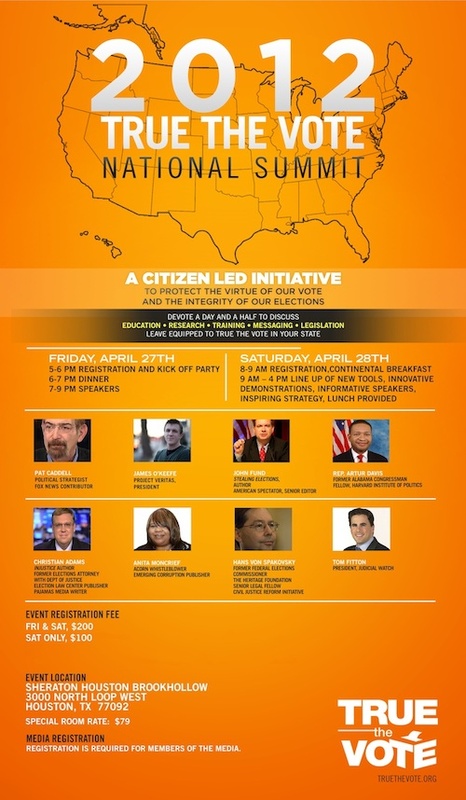 Join us on April 27th and April 28th for two days of extraordinary insights and information about how democracy is under attack in America today and what average American citizens like you – and me – can do to protect our vote. Thousands of concerned Americans have already joined our cause, but we need more help on the front lines. This month, we're hosting our second annual call to action -- a two-day summit in Houston, Texas the weekend of April 27th. It my sincere hope that you be a part of this our growing core of concerned citizens. True the Vote is a growing movement of every day citizens striving to actively protect the rights of legitimate voters, regardless of their political party affiliation. Isn't that something we can all get behind? For more registration information and other details, visit our website at www.truethevote.org, or go to the official event press release found here. Your commitment to protecting our nation’s liberty in the most basic—and yet crucial way – at the voting booth is honorable and appreciated. Thank you – and I look forward to seeing you in Houston on April 27 and 28th. Please contact me if you have any questions about how to register for this amazing conference.